“Why—why-er, you see, she fell down in the backyard and I had to cart her into the house. The beating of Mary Phelan shocked even the veteran police officers and court officials; it was the worst many of them had ever seen. “While Mrs. Phelan was visiting with a neighbor about 4:30 o’clock yesterday afternoon, Phelan appeared at the home of J.H. Bradley, 1560 E. 51st St.,” The Times said. “He walked into the room where she was seated and leaped toward her. Grasping his wife’s hair, Phelan began to drag her from the room. 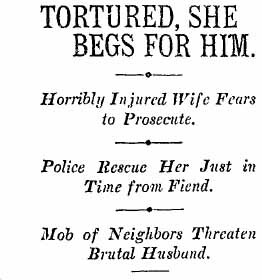 “Screaming for mercy, Mrs. Phelan pleaded to her husband to desist, but he paid no heed to her cries. Twice, he turned upon her, raising a club which he carried as though to strike her. Mrs. Bradley was too much terrified to interfere but when Phelan had dragged his wife down the steps, she ran to a telephone to call for assistance. “Once out of the house, Phelan began to drag his wife along. Suddenly he struck her a brutal blow in the face and she sank down. Two men saw Phelan knock his wife down when he had dragged her halfway up the steps and as she arose, extending her arms to him in humble supplication, he kicked her in the face. Then he kicked his wife up the steps, across the porch and into the little house. “Neighbors ran to their homes seeking arms and formed a rescuing party. In the meantime Patrolmen Hickock and Hickock had been detailed from the University Station on motorcycles and arrived soon after the little mob of enraged neighbors had formed. “Looking through a window leading into a front room of the Phelan house, one of the officers saw Phelan on top of his wife with both hands grappling her throat. He seemed to be prompted by a fiendish delight and was working his hands as he choked the breath out of his half-conscious wife. At this sight, the patrolmen dashed for the front door. “Phelan heard them coming and ran to open the door. As they showed their stars, the officers forced their way past him. One of them arrested Phelan, who coolly informed the police that his wife was drunk and had fallen and injured herself. And then the work truly began. Officers had to restrain the neighbors from lynching Phelan as investigators examined the trail of blood from the Bradleys’ home. Someone looked for the broomstick that had finally broken in half as Phelan used it to beat his wife, whose bloody clothes were mostly ripped from her body by the beating. And at the hospital, barely able to speak because of the beating, her body nearly shattered, Mrs. Phelan pleaded with officers: Don’t prosecute my husband, he’s my only means of support. Phelan drew a minimal sentence because his wife refused to testify against him and had it not been for the neighbors’ accounts, he wouldn’t have been prosecuted at all. Phelan sentenced to six months on the chain gang, but instead became a trusty at the University Station, where he served as a gardener. After public disgust over his light treatment, he was given one of the worst jobs at the jail: cleaning the hobos’ bedding. And Mayor Harper personally ordered that Phelan be put on the chain gang. It’s impossible to tell what happened to the Phelans once he was released. In one of those quirks of history, we find a Mary and Edward H. Phelan in Whittier. But they are apparently unrelated to the battling Phelans who moved to Los Angeles from Boston two years earlier. 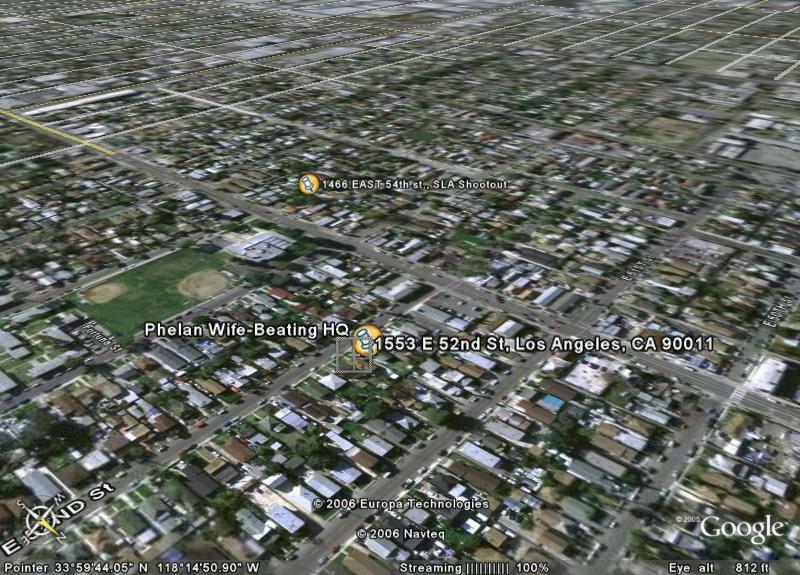 Note that Google Earth shows the Phelan home still standing and that it’s near the site of the S.L.A. shootout on the other side of Compton Avenue. This entry was posted in 1907, Crime and Courts, Homicide, LAPD, Streetcars and tagged 1907, crime and courts, domestic violence, lapd. Bookmark the permalink.